My in-depth look at setting up and running a Mac Pro continues. In the first installment, I shared my out-of-the-box experience and ran some tests on some apps. In the second, I talked about my observations of working on the desktop, perform audio and video tasks, and use Boot Camp and Parallels Desktop to turn my Mac Pro into a Windows-running powerhouse. In this third and final installment, I fire up my favorite games to test frame rates. I also test transfer speeds for FireWire drives and wrap it all up with a little methodology. Unlike the gaming section in my mini writeup, there’s no need to restrict what type of games I test on the Mac Pro. Whereas the mini lacks a graphics card of any kind, this Mac Pro is equipped with the built-to-order X1900 XT, ATI’s top-of-the-line Mac video card. Also, since I covered gaming peripherals before, I won’t go down that street again—basically, if they don’t need a driver and work on a PowerPC Mac, then they’ll work for sure. If they do need a driver, check the manufacturer’s site for an Intel-compatible version. This time, I thought it would be interesting to check in on one 3D graphics-based game that runs in Rosetta, as well as the one current game I own that runs on both Windows XP and OS X. I’ll also touch on the other games I looked at before, relative to their performance on the Mac Pro. At the conclusion of the demo, drop the console down again and you’ll see the average frames per second for the timedemo. So how did OS X hold up to Windows XP? In my tests, which I repeated three times, it was fairly consistent: on average, OS X scored right around 72fps, while Windows XP cranked out 90fps. So, it seems for this one game at least, the OS X “it’s a better OS” performance tax appears to be a 20 percent framerate hit. That’s a definite ouch , but it’s perhaps not quite so bad in the real world of actual gameplay. Quake 4 caps the refresh rate at 60fps in game play, and during my testing on the earlier levels, I have yet to see it drop below that when playing at the 1440-by-900 resolution. This difference should drop sometime in the future, too, assuming Quake 4 is patched to support the new multi-threaded OpenGL feature in OS X 10.4.8 on the Mac Pros. I’m not sure when, or if, we’ll see such a patch, though. In the short term, the game is very playable on the Mac Pro, even at somewhat higher resolutions. If you want the ultimate frame rate in Quake 4 on your Mac Pro, though, you’ll want to boot into Windows XP. 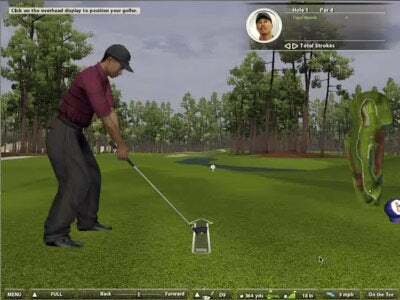 Tiger Woods PGA Tour 2005: This game has not yet been updated to run natively on the Intel Macs, so it’s a good test of gaming under Rosetta. When I tested this game on the Mac mini, I found it was almost playable—frame rates were low but acceptable, though it might get a bit too slow on busier screens. On the Mac Pro, by contrast, it’s very playable. Running at 1024-by-768 resolution, I was seeing frame rates anywhere between 20 and 45, with typical averages on holes in the 30s. Rates don’t drop too much when you add some wind and clouds—but don’t turn on the display of rain in the video settings, or you’ll see a dramatic drop in frame rates (though this is true even on my G5). To demonstrate the playability of the game, I thought I’d redo the video from the report on the mini. So here’s that same hole at the same resolution (1024-by-768 originally), except on the Mac Pro. And since Snapz Pro now runs on the Intel Macs, this capture is of much higher quality. As you can see, the screen refresh was relatively quick and fluid. Given that TW2005 is one of my favorite quick-play diversions, I was glad to discover that it had acceptable performance, even under Rosetta. I still have my fingers crossed for a Universal update, but even if it never comes to pass, the game is playable. Halo, Spider-Man 2, and Unreal Tournament: I discussed all three of these games in the original mini writeup in more detail. All three are Universal, and they all work wonderfully well on the Mac Pro. I ran a time demo in Halo, with every setting maxed out (advanced pixel shaders, 9x anti-aliasing, extreme lens flare, high model detail), and scored 43fps at 800-by-600. With the anti-aliasing dropped down to 4x and the lens flare to high, that number shot up to 112fps. In actual play, at 1440-by-900 resolution, the game is amazingly smooth and glitch-free. 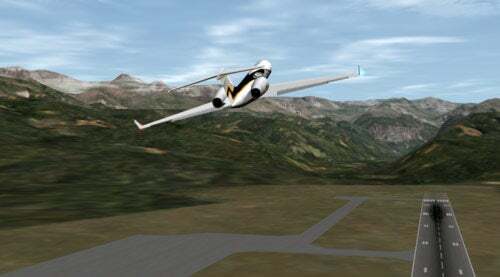 That’s a take-off out of Telluride airport in Colorado, with some low clouds in the mountains. If you’ve ever been to the airport, then you know that this is basically the view off that end of the runway (though in reality, they typically take off in the other direction, wind permitting). Contrast the above image with the fog-shrouded view on the PowerBook from the previous report, and you can really see the payoff from the faster CPUs and video card. Quake III Arena: Not a whole lot to say about Quake III Arena, other than 718fps. No, that’s not a typo. That was the built-in timedemo result at 1024-by-768 in the Universal Binary version of Quake III. By way of comparison, the mini managed a paltry 90fps. Even my Dual G5, with the ATI X800XT, scores only in the 285fps range. Yes, it’s meaningless for today’s games, but it shows you just how quickly the Mac Pro can dump graphics onto the screen. Overall, the Mac Pro makes an excellent gaming machine. However, given its price point, it’s definitely not the most economical gaming machine you can buy. That said, if you’re a Mac user, you enjoy playing games, and your plans call for a new Mac Pro at some point, you won’t be disappointed by its gaming performance. While high-end PCs will still make better gaming platforms (thanks mainly to their ability to use multiple video cards to draw to a single screen), the Mac Pro isn’t a slouch by any stretch. Based on my one-game cross-platform test (Quake4), it seems there’s still a bit of a performance hit for using OS X instead of Windows XP. However, it’s not a terrible hit, and it may be worth it to save the reboot time. Don’t justify a Mac Pro purchase decision base purely on gaming capabilities; it makes no economic sense. You could buy two 60GB Playstation 3s ($599 each), two Xbox 360s ($399 each), and a couple of Nintendo’s Wiis ($250 each), and still save money over the cost of the Mac Pro. Buy the Mac Pro for all the other things it does very well. If you do happen to buy a Mac Pro for other reasons, you’ll be more than pleased with its abilities as gaming machine.